There is something about building a Sand Castle at the beach that is so satisfying and spectacular. The sand feels wonderful beneath your toes and molds to your body. The sand can be formed into anything your heart desires. On our dairy farm, our cows are equally excited about sand. Sand is their bed. Sand is the best bedding we can use for both our cows comfort and health. At Fairmont, we use “deep sand beds” which means there is not even a floor to the bed, it is all sand. The sand molds to cows bodies, just like ours at the beach, making a custom bed for each animal. This type of bedding has proven to be the top choice for dairy producers when it comes to leg comfort, providing a soft spot for the cows hocks to rest and an easy material to get back up in. Sand also beats out other bedding choices due to the nature of it being non-organic (not related to or derived from living matter), meaning the growth of bacteria is a non-issue compared to bedding with shavings for example that comes from a living organism. The growth of bacteria in bedding can lead to infections of the udder, called mastitis. That is why it is very important for our cows health and the quality of our milk to use the best bedding we can find. Our girls enjoying their beds! With all of the positive aspects of sand, finding a plentiful and consistent source for our bedding is often troublesome. With our recent purchase of the Norman Dix property on Route 2 in Plainfield, we found sand! If you are local to our Central Vermont area, you may have seen the project we were working on this winter. We have been digging sand and running it through a screener to ensure a high quality bedding product for our cows. By extracting the sand we were able to improve the field by making the unused hill in the middle of the field usable! Another added bonus was driveway material that was screened out of the sand. Our trucks have been busy this past winter hauling sand to the main farm in East Montpelier to stockpile top quality bedding for all the beautiful ladies at Fairmont Farm! This girl is captured getting some beauty rest in a clean and comfortable sand bed! Our cows…the reason why we love sand like a child on the beach. Being able spread manure without driving manure trucks to and from the farm….this is now possible through drag hosing! This spring we hired Eric Severy to do some drag hosing from the main manure pit at Fairmont Farm as well as our new satellite manure pit at “The Haven”. We do recognize the impact we have on our community and our neighbors and are excited to share that by keeping our trucks off the roads by drag hosing 225 acres, we were able to reduce that impact! Drag Hosing on Vincent Flats Road in East Montpelier. This picture is taken between half a mile and a mile from the Farm. This system takes quite a bit of setup which involves A LOT of hose, use of town culverts and owned and rented land to spread the hose on. Pit Crawler at work in the Fairmont Farm manure pit. This crawler stirs up the manure and sand (from our bedding) to make a consistent and spreadable product. This is where the drag hosing begins! From here a pump works to move manure from the pit through the hose and all the way to the fields. Across a field (which happens to have a great cover crop on it!)…. and finally…to the tractor spreading on Vincent Flats! This was a really fun experiment for us this spring, something that we are excited to give another try either in the fall or next spring. We were able to move manure much quicker with this technique and there was less wear on our equipment and the roads! While we would love to use this technique on all of our fields, we have a large number of fields that are a distance away and the logistics would not work out. For those fields you will see our equipment out on the roads, you can check out this post from last spring on road safety. 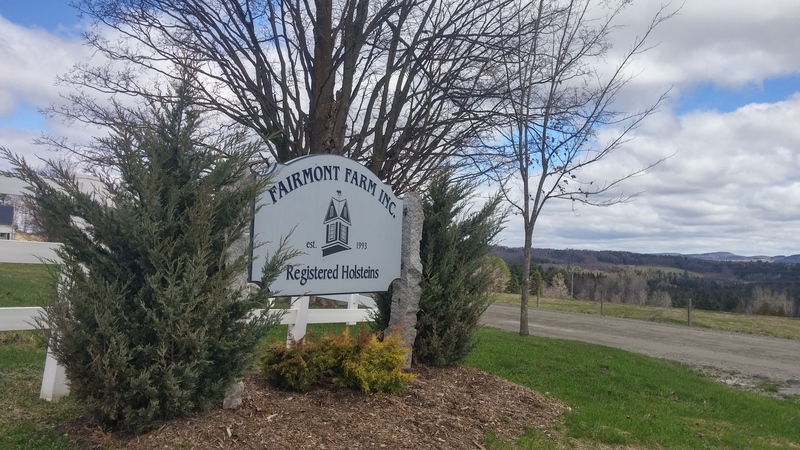 Here at Fairmont Farm, Spring is finally in full swing. We are happy to have the longer days, warmer weather and hints of green! With a late start to the growing season, we are bustling around to get everything going. 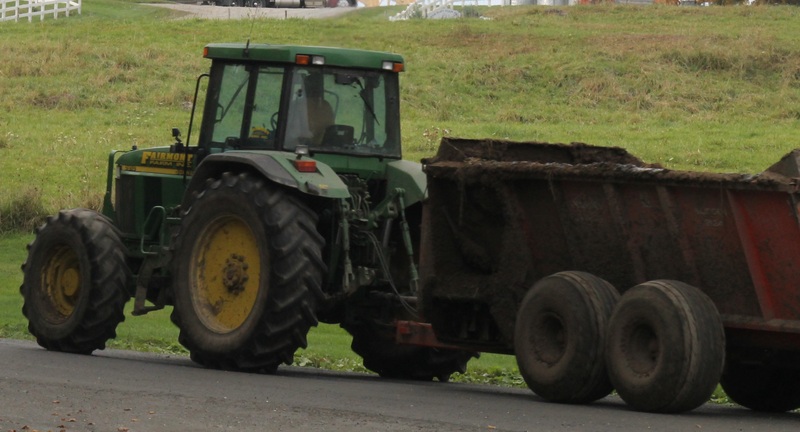 Manure spreading has begun and will continue throughout the spring. Last year, we stopped spreading manure on our fields before the December 15th Winter Spreading Ban because of snow on the ground. When the Ban was lifted on April 1st, our fields were still too wet to spread on so we continued to wait until conditions improved (the Accepted Agricultural Practice). With a little over four months that we did not spread, our manure pits are close to full and we are glad to begin applying nutrients back onto the land. Although we do use some fertilizer, our manure accounts for a good amount of the nutrients our crops need. We crop about 2,500 acres in East Montpelier and the surrounding areas and we crop another 1,000 acres in Craftsbury and the surrounding areas. Spreading in Craftsbury, VT at Fairmont Dairy, LLC, what a beautiful view! We hope that our neighbors and communities enjoy the beautiful farm landscapes around them. Being good stewards of the land, being a part of our community and being good neighbors is extremely important to us. You can visit our website and read about our “Manure Management“, we are constantly trying to evolve the system that we have to improve water quality, crop yield and efficiency. We are very excited about a couple recent projects that will reduce Spring road traffic and greatly improve soil compaction, leading to improved water quality and crop yield. This is our new “Frac Tank”! It works as a holding tank on the side of the field allowing us to move manure with Semi-Tankers. The tankers can unload into the Frac Tank rather than needing to go on the field, this keeps only our spreaders with flotation tires in the field which reduces soil compaction. While we do our best to reduce the Farm traffic on the roadways, you will still see a lot of us. Safety is a top priority of ours, so when our equipment is on the road there are a few things you can remember to ensure both your safety, and ours. Please remember that we often will turn into or out of a field driveway that you may not be expecting, our equipment is often large and slow but we are not on the road for long. Vermont Agriculture put out a great Youtube video about road safety and farm equipment, please take the time to watch the video and share what you learn with your friends and family!